Delicious shortbread style cookies with plenty of nutty goodness. Love those Keebler cookies? 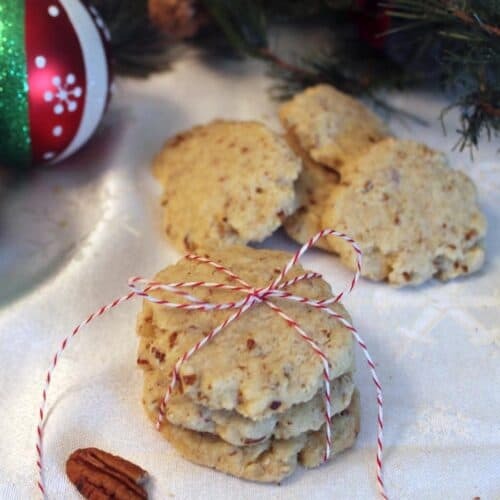 Make your own Pecan Sandies with this easy and tasty recipe. In a large bowl, cream butter and sugar until creamy. Continue beating while adding extracts. In a medium bowl, mix flour, salt and pecans. Add to creamed mixture and beat until well blended. Form into a ball and wrap in plastic wrap. Chill in refrigerator for 30 minutes to 1 hour. Preheat oven to 325 degrees. Prepare cookie sheets by lining with parchment paper. Remove dough from refrigerator and roll into 1” balls. Place on cookie sheets. Flatten to about 1/2” thickness with bottom of a glass dipped in flour to prevent cookie from sticking to it. The cookies do not have to be placed very far apart as they will not spread. Bake for 16-20 minutes. When done, let cool for 3-5 minutes then remove from cookie sheet and let cool on wire rack.